The Taprite Soft Drink Carbonation Tester is a great tool for verifying and maintaining CO2 levels in sugared soft drinks. 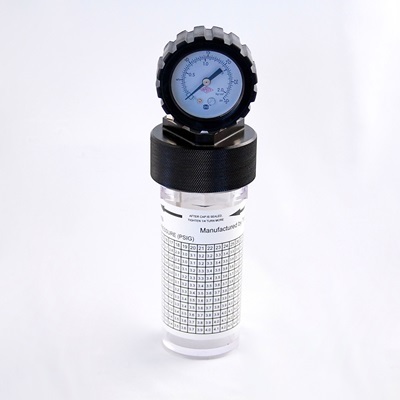 Simply put a sample of your beverage into the tester’s 11 ounce acrylic canister, record the pressure and temperature from the easy to read gauges, and cross-reference your findings with the data on the handy carbonation table. The Tester’s cap and fittings are made of lightweight, anodized aluminum with easy to grip knurling. The pressure gauge includes a protective rubber boot (600GPS-01) for additional durability. Taprite’s Soft Drink Carbonation Tester is easy to handle, easy to use, and easy to clean, and is a must have for every Field Service Technician.